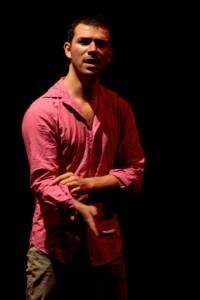 Guillermo Ortega Tanus (Dance Artist-Educator-Lighting Designer). is a Mexican artist who lives and works in Philadelphia, PA, United States. Together with Eun Jung Choi he co-directs Da·Da·Dance Project (US-Mexico), a duet repertory company that has been presented at International venues and Festivals in Korea, Unites States, and Mexico. With Da·Da·Dance Project Guillermo has perform the choreographic work of Melanie Stewart, Elise Knudson, Helena Franzén, Luke Gutgsell, Gerald Casel, Eun Jung Choi and himself since 2008. The company most current project in the works is a piece named “The Strangest Thing” by Mexican dancer-choreographer Erick Montes. Parallel to Da·Da·Dance Project he has also presented solos at Dixon Place, Newsteps Series, Merce Cunningham Studio, Conwell Dance Theater, Chew the Fat! At Studio 34, New Festival, Mix Grille, Conwell Dance Theater, and Tlacochimaco in Unites States. Also at Foro Experimental, Fuego Nuevo, Los Talleres de Coyoacán, La Casa de Las Bombas in Mexico. He has set work in Tatiana Zugazagoitia Danza (Merida, Mexico), and the students of the Diploma in Dance of the Cultural Center “Los Talleres A. C.” (Mexico City). He has danced for numerous companies and artists in both Mexico and the US including UX Onodanza (Mexico), A Poc A Poc (Mexico), Eterno Caracol (Mexico), Kelly Nipper (LA), Miro Dance Theatre (Philadelphia), David Gordon’s Pick Up Performance Co. (NY), Risa Jaroslow and Dancers (NY), Anonymous Bodies (Phila), Group Motion (Phila), MacArthur Dance Project (Phila), Nicole Canuso, and others. He received the “Rose Vernick Choreographic Achievement Award” 2013 by Temple University´s Dance Department for the piece Drift. He also received the “Artistic Achievement Award in Performing Arts” 2011 by Golden Key International Honour Society for his solo Cafeina. Guillermo has received grants as performer, creator and Student from “National Fund for the Culture and the Arts” (FONCA) 2007-08 and 2009-2012. Mexico en Escena (2005-06); the State Foundation of Culture and Arts (FOESCA 09-10); among many others. He was a resident artist at nEW festival (2009-10). Past artistic residencies include BiLateral Budapest/Philly (2013),a three-week dance artist residency exchange in Budapest curated by Philadelphia Dance Projects and Workshop Foundation. Instituto Sacatar (2014), a two-month residency in Itaparica, Bahia Brazil curated by the instituto Sacatar and supported by DanceUSA Philadelphia (Dance/UP). Art Mill Retreat (2012), a two-week retreat at Jefersonville, NY curated by Alberto Denis. nEW Festival (2009-10), a two sessions festival directed by Melanie Stewart in Philadelphia, PA. He holds a BFA in contemporary dance from the “Escuela National de Danza Clasica y Contemporanea” as well as a MFA from Temple University. Currently, he is an adjunct professor at Rowan University. He has also taught at Temple University and Georgian Court College in U.S. and also as a guest artist at festivals and Universities in Mexico. Guillermo worked in the Conwell Dance Theater for 3 years while studying his MFA at Temple. During this time, he tried different hats in the production side of dance. Guillermo (true to his multipotentialite nature) has also worked as a lighting designer, production manager, and stage manager. Currently, Guillermo is studying Thai Body Work.